The old Northern Avenue Bridge opened in 1908, at times carrying train traffic, cars, pedestrians, and even cyclists up until it closed for safety reasons in December 2014. Now in 2016, the future design of its replacement was entertained through a design competition that brought 133 submissions, comprising 99 graphic designs and 34 essays. The Boston Northern Avenue Bridge Ideas Competition was launched in March as a partnership between the City of Boston and the Boston Society of Architects (BSA), seeking innovative designs that looked at improving mobility, honoring history, and creating destination. A sixteen-member jury was assembled by the City and the BSA to judge the entries. The jury was made up of architects, designers, to artists, preservationists, transportation advocates, and planners. At the award ceremony for the competition, Mayor Martin J. Walsh addressed the 200 guests, praising the process of this competition for bringing out members of the community, architects and designers to put their interests into what the future bridge should look like. “The ideas and conversation that we sparked during the process are tremendously valuable as we take the next step to design a new bridge, and I thank all who participated,” said the Mayor. The eight most compelling submissions that best addressed the competition themes in the eyes of the jury were awarded a total of $15,000 in prize money. The +(plus) Bridge replaces an aging infrastructural landmark along the Boston waterfront with an elevated civic space and iconic community destination where “+” marks the spot. The Northern Avenue Botanical Bridge (NABB) serves as an armature for pedestrian travel and a greenhouse where botanical gardens flourish year round. Using biology and wildlife to help the bridge gracefully decay while creating an urban landscape. Creating a dynamic park environment that reflects the historical integrity of the bridge while serving as a destination space for the community. Bringing Boston back to its roots, where bricklayers and the machinists helped forge Boston’s growth and development in the 20th and 21st centuries. This bridge honors the contribution of these blue collar workers with a steel structure, constructed by the hands of laboring men, which aims to remind us of the immigrants who were not always welcomed, yet built our city’s modern foundation. The Northern Avenue Bridge is made of steel, sitting on granite and concrete, where the “opening of the bridge should symbolize the opening of opportunity,” read the full essay. With the vision of a city of motion, this essay profiled a bridge that, “breaths and pulses, rolls and rides and steps with purpose.” Branding the bridge as a gateway to the channel towards the part of Boston that embraces the harbor as a living organ that can be interacted with. Through a launching pad for kayak rentals and a kiosk for the Dragon Boat Club, diving two ends of the city with high-rises at both ends, the bridge providing an outlet with plazas for merchants serving hot chocolate and cider, while also encompassing history into the design, read the full essay. Save, restore and Steampunk (fusion and reimagination of past, present and future) the NAB in place with its swinging operation for boots, bikes and buses. 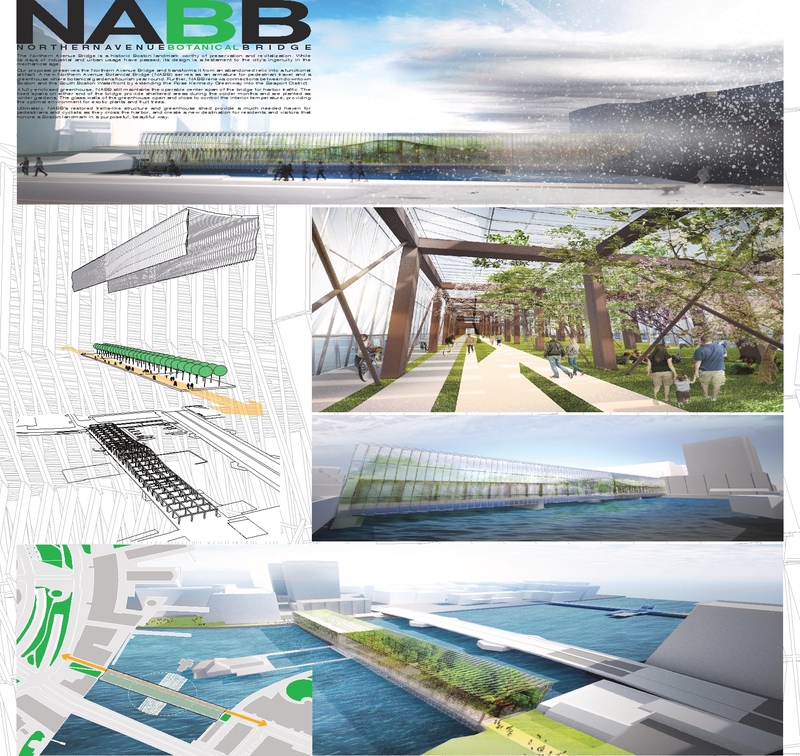 Our concept explores the relocating of the 280′ swing-span truss of the Northern Avenue Bridge (NAB) up stream to the historic alignment of the lost Mt. Washington Street Bridge, and the future Fort Point Channel Mall. In case you thought this contest was just for fun, a request for proposals is currently being drafted by the Boston Public Works Department, with the hope of it being released in the next couple of months. View all the design and essay entries. The +(Plus) bridge looks appealing, but at closer inspection it appears that it would close off any access to the channel from the water. There are already docks with slips for boats inside of the Northern Avenue Bridge and as Fort Point Channel is continuing to develop, it seems sort sighted to close it off to future uses such as, water taxis, kayakers, etc. It would be great to see Fort Point become an active waterfront again.